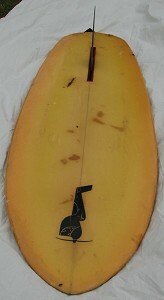 1979 George Greenough Design Kneeboard, Shaper: Chris Brock 5 ft 6 1/2"
Foam blank, 1/8" redwood stringer, spray decor, finbox, left hand leg rope plug. 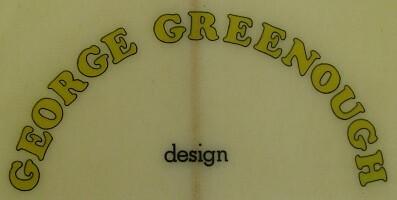 GEORGE GREENOUGH DESIGN semi-circle in yellow and black at sweet spot. 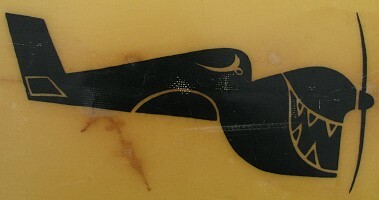 Greenough's famous Curtis P-40 Warhawk fighter/bomber (May 1940) graphic - black at nose. Deck: Shape by Chris Brock Black pencil at pod. Bottom: 0111368 - pencil at the pod. Bottom: Light yellow spray, red pinlines around finbox. Board added to surfresearch collection April 2008. There was no provenance from the seller. 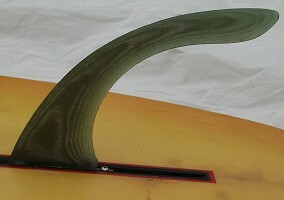 Because the high performance capabilities of the design were only achievable in quality waves and the low floatation meant that only the most fit riders were able to catch waves, in Australia by 1973 the design was largely supplanted by Peter Crawford's Slab design, circa 1969, see # 83. Initially Peter Crawford simply filled in the spooned deck to greatly increase floatation and expand the wave range, but over a long life the Slab was adapted with a range of rail shapes and fin configerations, see # 58. George Greenough/North coast freefall, circa 1966. First published Surfing World Vol No 1968? This cropped version from Margan and Finney , page 310.
not achieved by stand up surfers for another ten years. George Greenough and Spoon. by Eric Blum as told to Al Lees. 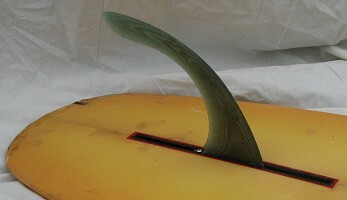 Sky Kneeboard 5 ft 8 1/2"
Bob McTavish : 'Bout a Spoonful. Bob McTavish's eight easy steps to (Greenough) Spoon building. Vol.2 No.2 1999 Pages 76-77, 84, 86-87. “Still others like a short bellyboard (sic) and a long ride like George Greenough at Santa Barbara, California” – Bruce Brown in the introductory sequence to The Endless Summer. 2. The Hot Generation Paul Witzig 1967 (May).